New York Rx Card and United Networks of America Present Donation to John R. Oishei Children’s Hospital. New York Rx Card representative, Kathryn Tripi, presented a donation for $4,112.55 to Lisa LaTrovato, Sr. Development Associate of the Children’s Hospital of Buffalo Foundation. Lisa is excited about the partnership with New York Rx Card along with the opportunity to help create awareness for this needed resource. Located in the picture are Lisa LaTrovato, Kathryn Tripi and two former patients who have benefited from the care of Oishei Children’s Hospital. New York Rx Card has been working closely with the Medical Society of the State of New York, John R. Oishei Children’s Hospital along with numerous clinics and hospitals around the state to distribute free discount prescription cards so that all New York residents will have access to this free program. 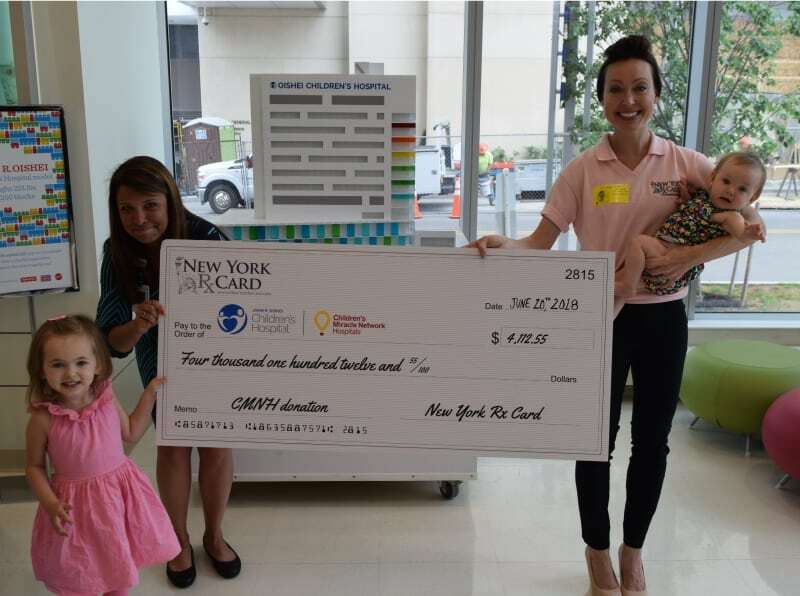 A donation will be made to your local CMN hospital each time a prescription is processed using the New York Rx Card. Since 2015, the United Networks of America partnership with Children’s Miracle Network Hospitals has raised over $2.4 million dollars for local children’s hospitals. Of this, $4,112.55 has been raised for John R. Oishei Children’s Hospital. The Oishei Children’s Hospital will replace the current Women & Children’s Hospital of Buffalo, which is located on Bryant Street. The historic project will right-size and consolidate services in a 12-floor, 185-bed, free-standing, modern facility on the Buffalo Niagara Medical Campus. It will be an integral part of the campus, linking with Buffalo General Medical Center, the Gates Vascular Institute, Roswell Park Cancer Institute, the new University at Buffalo Medical School and more. Not only will the Oishei Children’s Hospital be the link for the Buffalo Niagara Medical Campus, but the hospital today – and in the future – will be the only link for comprehensive pediatric health care for Western New York. The Oishei Children’s Hospital ensures pediatric and maternal services remain available for patients in the Western New York region. The vision for the new hospital is to be recognized as the innovator, the highest quality, highest value provider and partner, and the regional referral center for women and children’s health care for Kaleida Health, Western New York and beyond. It is the only access point for pediatric critical care, Level III neonatal intensive care, and Level 1 Pediatric Trauma Centers in and for Western New York. The sickest babies and children come to the hospital for care, either directly or through transfers from other hospitals. Without the resources available at Women & Children’s Hospital of Buffalo, these young patients would have to travel out of area for care.